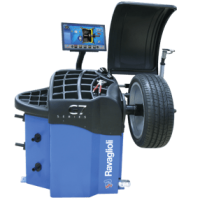 The new G3.140RS Smart balancing system by Ravaglioli offers high end features at a mid range price level. This versatile system allows you to customize your machine from a large range of accessories and features. The machine can be accessorized as a basic video wheel balancer or can be outfitted with digital data arm so that it becomes a complete diagnostic balancer capable of measuring tire and wheel run-out condition. 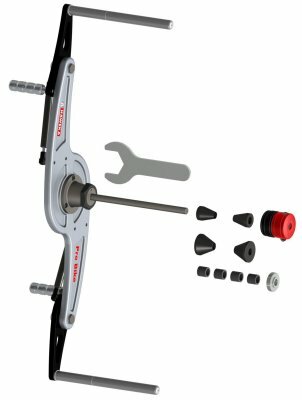 High end features include laser pointer, LED lighting of wheel interior, ECO weight program to eliminate 2 stick-on weight planes and combine it to one stick-on weight placement, inner data entry arm functions as eccentricity measuring device of the rim, and much more. We have equipped one floor model with the Sonar Eccentricity Run-Out Device that lets us measure tire run-out automatically everytime the balancer spins the wheel. If the tire/rim combination shows to much run-out, (measures the high and the low with the Sonar at the tire tread). The problem of the vibration of the tire/rim can now be diagnosed. Using the data entry arm of the balancer we can find the high and low spot of the rim, than take the high spot of the tire and put it to the low spot of the rim to make the tire/rim combination as "round " as possible. Reducing the Out of roundness will minimize the vibration, before the wheel actually should be balanced.